One thing I really like about living in Japan is that people don’t usually touch each other when they greet. The great thing about this is that you always know what to do: nothing. There is zero risk of an awkward handshake. In Australia however, I’m always a bit clumsy when I meet people. Should I shake hands? Or should I be more ladylike and warm and give them a hug or a side-cheek kiss? Or is that too familiar? My gym in Tokyo takes convenience to a whole new level. Every time I show up I get freshly washed gym wear, shoes, and socks. It really beats lugging a heavy gym bag on the crowded trains every day. There’s just one problem… my average sized Aussie feet are considered to be ridiculously large in Japan. With size 26.5 cm feet, I can’t fit into ladies shoes. What’s a Big Foot to do? The answer is simple: wear mens shoes. But in reality, nothing is simple when you’re a totally conspicuous and communication-challenged foreigner like me. At my gym the mens shoes are kept in an alcove outside the mens changeroom. The men can help themselves. It’s an honesty system and it actually works. Amazingly, no one steals the unsupervised brand-name shoes. The first time there was no problem. It was early in the morning and there weren’t many members around. I just walked straight in and took the shoes. When I finished my workout I put them back into the men’s return slot. No one saw anything. I survived a day in Japan without getting busted breaking any rules. Unfortunately, the next time I went to the gym, there were more people hanging around. I managed to grab the shoes from the men’s alcove without getting caught, but when I went to put the shoes back, things got complicated. Just as I entered the men’s alcove, the changeroom door sprung open and a man came out. He looked very unimpressed when he saw me trespassing. He told me (in Japanese) that this was the men’s area, and that the ladies changeroom was on the other side. This is my giant cat George Vanilla-Gorilla. He is too fat for Japan so I left him with my parents in Australia where he has become a neighbourhood legend. He waits on the front fence all day for people to walk past, pat him, and rub his stomach. Having George (and his twin sister Jasmine Vanilla-Bear) has really changed my outlook on life. I never had a pet growing up so when people talked about their pets and showed me photos I felt completely indifferent and disinterested. I used to nod and smile politely, but inside I was bored out of my brain and I secretly felt like they were being socially inept to talk about such a dull topic. But then my younger sister got a cat (Wilbur) and she let me cat-sit for a few weeks. During those few weeks, I grew to love Wilbur, despite the fact that he was snooty and refused to be in the same room as me. After he moved out, I missed him and his cranky glare so much. I waited for the feeling to pass but after a few months, when I still really missed him, I decided to get my own cats. George and Jasmine brought so much happiness and joy to my life and, despite being called a crazy cat woman by everyone, I couldn’t stop myself from talking about them and showing people pictures. I’ve been so surprised by the strength of my feelings for my cats. I had nothing to do with creating them and the feeling certainly isn’t mutual - they couldn’t care less whether I lived or died. But I don’t mind. I love them even more. Now I’m enthralled by other people’s stories about their pets. I can spend hours on the internet looking at cat photos and movies. And when I see a stray cat wandering the streets of Tokyo I feel happy and excited. This extreme change has left me wondering what other things in life I don’t understand and have misunderstood because I haven’t experienced them yet. For example, I have no interest in car racing and I find it really boring when people talk about it. Am I missing something? Is there a magic trick I can use (like getting a cat) to become interested? When will the next book in the Dusk Duo series come out? Do you have any plans to write more books? How can we contact Sandra? 1. What is the point of this blog? This blog is a platform for author Sandra Thompson to keep in touch with her readers. The posts follow three main topics: news about Sandra's books, stories from Sandra's daily life, and tips about the writing process. Many of the posts in 2013 are about Sandra's experiences while living in Japan, giving a sneak preview into the flavour of her upcoming book The Sakura Vacancy, which is set in Tokyo. 2. Where can I buy your books? The Ghostly Grammar Boy e-book is available for free at iBooks, Smashwords, Barnes and Noble, and Kobo. For a free Kindle version, ask Amazon to match the price of other retailers. The print book is available for less than $10 on Createspace and Amazon. Check it out and leave a review! The first three chapters of The Ghostly Grammar Boy and The Deadly School Camp are also available free on this blog. 3. When will the next book in the Dusk Duo series come out? There’s not long to wait! The planned release date for book two The Deadly School Camp is July 2015. You can keep up-to-date on Fiona and her supernatural high school adventures by checking out the The Deadly School Camp page. Feel free to leave your comments and suggestions! 4. Do you have any plans to write more books? Absolutely! Sandra is always writing and she has several new books partially completed. The Deadly School Camp, book two of the popular Dusk Duo series is scheduled for release in July 2015. Check out the first three chapters here and all the latest news and information on the Books page. Sandra is also working on a romantic suspense novel set in Japan. The Sakura Vacancy is scheduled for release in July 2015. You can read all about it here. 5. How can we contact Sandra? Check out the first three chapters available now for free! Carly Taylor’s perky ponytail was blocking my view. Not that I wanted to see the whiteboard anyway. It was way too hot for the first day back at school. No one, including me, was paying attention to Mrs Murphy’s drone. The slippery stains of her colossal sweat patches were just too distracting. My friend Lara fidgeted next to me. Like me, she was dying to get out of this blistering classroom and into the refreshing water of the local pool where we were working as swimming instructors this afternoon. The summer break had been rough. Canberra’s relentless heat wave had robbed us of any chance to enjoy our emancipation from school. In an attempt to spare ourselves the demeaning task of begging our parents to drive us three hours to the closest beach, Lara and I had decided to trade our services. We were teaching screaming kids to swim for some extra pocket money and cool water. I shifted uncomfortably in my seat as Mrs Murphy’s bulging eyes glared at me, before she turned her sweaty self back to the whiteboard. Gross. And ouch! My thighs were currently stuck to my chair. That’s the thing about living in Canberra. Stinking hot summers and bushfires are followed by icy winters. Canberra’s quiet, crime-free streets are lined with government offices and businesses, family homes, and beautiful parks. Parents considered it a safe place to raise children. Most of us teenagers couldn’t wait for the day when we could escape and get a life. I wasn’t one of them, though. There was one thing I really liked about Canberra. Something that I wouldn’t trade for the best nightlife in the world. Canberra doesn’t have many ghosts. Don’t get me wrong, Canberra has some ghosts—far too many of them—but compared to older cities like Sydney, there are far fewer of the menaces around. Unfortunately, most people don’t appreciate this like I do. Mainly because I’m the only one I know who can see and talk to ghosts. Ghosts have plagued me my whole life. As long as I can remember, they’ve been wanting to chat with me in the middle of a maths exam. Or play charades when I’m trying to shoot the tie-breaking goal at netball. And just so you know, I totally blame my sister Ella. Ella is my twin. She’s six minutes younger than me, and often, six times more annoying. Mum said that as babies we shared a special bond. We would talk to each other in baby language and cry if we were separated. We always wanted to play with the same toys, and we followed each other everywhere. Unfortunately for me, this special twin bond must have been extremely strong because when Ella mysteriously died in her sleep when we were two years old, our bond continued on a spiritual plane. So years later, while my parents were still grieving for Ella, I was playing hide and seek with her. My parents thought I had an imaginary friend. Now, thanks to our connection, I have to play hide and seek with all the other ghosts around—not a fair game when you’re playing with ghosts. For example, what chance did I have right now of hiding from Ella when she’d suddenly decided to appear and sit on my desk? ‘Get off! I can’t see the whiteboard!’ I hissed at Ella. ‘Yeah, sure, great,’ I mumbled into my hand. After years of practice, I’m getting pretty good at making my talk sound like I’m clearing my throat. I was still getting weird looks from my classmates though. Carly Taylor had even turned around to glare at me. ‘Uh oh, I think you’re interrupting Carly’s daydreams about what she’s going to do with Shane at her pool party this weekend,’ Ella snorted. Pool party? It annoyed me that even my dead sister was more down with the social calendar than I was. ‘Okay, okay, keep your pants on. I’ll leave you to your precious trig. See you tonight.’ As Ella faded, she couldn’t resist annoying me a bit more. She ruffled my straight, dark brown hair. Instinctively. I tried to bat her hand away from my head. Incidentally, that’s another special gift I have. I can not only see ghosts, but can touch them as if they were alive. To me they feel like normal people with deathly cold skin. Most people tend to pass straight through ghosts without realising it. Or, occasionally, they’ll feel a cold sensation. This means that if a bunch of ghosts passed through our classroom right now, my classmates would probably appreciate the cool breeze, whereas I would have to make sure I moved so I didn’t get trampled on. And that would look really weird—jumping up in the middle of class for no apparent reason. I would definitely earn another glare from Carly. Not that I care what Carly thinks of me. Carly is one of the ring leaders of the popular group that make everyone else’s life at high school hell. Unfortunately, our last names both begin with the letter T, so we always end up stuck near each other when our grade is organised into alphabetical order. Think about it. That means she’s next to me in the line for school portraits. She’s always in my roll call, maths and English classes. She always sits next to me in exams. And we’re always in the same group on school camp. However, unlike other people in our year, I don’t live in awe of Carly. I don’t go crazy at the sight of her perfectly layered blonde hair, big brown eyes, and long, slim legs, like everyone else seems to. It’s one of the reasons she doesn’t like me. But that’s okay because the feeling is mutual. Which is why last week it was so weird when she was nice to me. I’d managed to convince my older brother Brett to drive me to the shops for the January sales by bribing him with the promise of a sundae at the new ice cream shop. I desperately needed a new bikini. The swimming carnival was coming up in term one, and I was not going to be the only year-ten girl in a one-piece, like last year. Mainly, we both wanted to get out of the heat and into the air-con. After two minutes of looking at the bikinis in a trendy swimwear shop, I realised there was no way I could afford any of them. I was either doomed to a one-piece or I would have to buy a cheap bikini from the family department store. It was time to give up and get ice cream. As we walked into the popular new ice cream shop, I realised too late that Carly was working behind the counter. Trust her to not only get a job in air-conditioning but to get the only job in Canberra that involves unlimited access to free ice cream. ‘Hey, Carly. Two cups of triple chocolate chunk, please,’ I ordered as I passed her my money and tried to pretend I was indifferent to the whole situation. Carly looked at my face. In a deliberate manner, she lowered her eyes as she checked out my clothes. I’d seen her do this to others before. It was a subtle move designed to leave you feeling self-conscious. I refused to let her make me feel bad. I was wearing short shorts that were great for the heat but exposed my freckled legs and uneven tan. I was also wearing one of Brett’s baggy t-shirts for good air flow. I’d roughly tied my straight brown hair back in a ponytail to keep my neck cool. Carly, on the other hand, looked like she’d stepped straight out of a fashion magazine, with her summery dress showing off her long, tanned limbs. Her blonde hair was pulled up in a ponytail artfully designed to look messy and casual, but from the faint smell of hair spray, I knew it had been carefully styled. I pretended not to notice Carly’s inspection. Her large brown eyes returned to my face to deliver the final part of her routine—her trademark look of disdain mixed with pity. The disdain made girls feel self-conscious, whilst the element of pity delivered hope that maybe they could one day be her friend. This subtle balancing act allowed Carly to maintain her posse of followers wherever she went. Carly was just about to give me her trademark look when she noticed my brother. Instantly her face lit up. Brett tends to have that effect on girls. Personally, I can’t see the attraction. ‘Fiona! Hey! Great to see you again! Is this your brother? Brett, right? I’m Carly,’ Carly giggled as she extended her hand to Brett. She then fidgeted with her hair in a fake display of nervousness designed to make her seem approachable. I had to give her credit. The girl was a master of flirtation. She hadn’t counted on my oblivious brother though. ‘I’ve seen you around school. You’re in year twelve, right?’ she continued. ‘That’s right. So you’re at Canberra High too? Are you in the same year as Fiona?’ Brett replied. Brett’s the type of easy going guy who is happy to have a chat with anyone. This, along with his dark hair, grey-green eyes, and apparently hot, rugby-toned body has made him very popular. It also means that I have to watch shameless flirts like Carly work their moves on him. Luckily for me, Brett is totally clueless about all the attention he gets—living in a dream world of music and rugby union. Carly leaned into the counter and allowed her hands to brush Brett’s as she passed him his cup of ice cream. Sickening. ‘Yeah, Fiona and I are roll-call buddies. We go way back. Had some good times.’ Carly proceeded to prove this false claim to friendship by jovially slapping me on the arm with a paper napkin. She continued on, despite my incredulous look. ‘Hey, aren’t you friends with Shane Harris?’ she asked Brett. ‘Shane? Yeah. Fun bloke. He’s on my union team. How do you know him?’ Brett asked as he took his first mouthful of chocolatey goodness. Well, I could only imagine it was good, since Carly seemed to have completely forgotten my order. ‘Oh, you know, hung out with him through friends a bit over summer. Say hi to him from me,’ Carly replied as she handed Brett my change, her fingers brushing against Brett’s again. Having suddenly lost my appetite for ice cream, I dragged an oblivious Brett out of the store by the arm. As we left, Carly called out to me in a friendly voice that would have had me fooled if I hadn’t been hardened over the years to her tactics. Things felt much less surreal now that we were in maths class and Carly was back to glaring at me again. Teaching kids to swim was hardly the cool relief I’d been hoping for. ‘Brian! Do you want to sit out?’ The little punk had splashed me in the face yet again. I understood that the kids were excited to be in the water, but it would really help my job if they’d apply their excess energy to their strokes rather than to splashing me. I didn’t remember being this hyperactive when I was in primary school. I looked over at Lara. Her deceptively strong yet slim arm muscles flexed as she helped a child push off from the wall. Lara was a natural-born athlete, with long limbs, a powerful frame, and boundless energy. Her curly, chestnut brown hair clung in stringy wet ringlets to the sides of her heart-shaped face as her hazel eyes intently watched her class. Lara’s students were obediently practising their tumble turns. No surprise there. Lara is one of those girls who commands respect. Her calm demeanour seems to inhabit a five-metre radius around her. Unlike me. Somehow I generate a war zone wherever I go. I grabbed hold of a freckled arm that flew past my face in an awkward attempt at freestyle and offered some helpful coaching. Unfortunately, the squirming eight-year-old attached to the freckled arm had little interest in my wise advice. I hoped her parents weren’t witnessing my unsuccessful attempt to teach their daughter. It was hard enough meeting my own parents’ expectations without having to answer to other kids’ parents as well. I don’t know why I’d ever thought this was going to be an easy, fun job over summer. My stress seemed to heat up my body more than the water cooled me down. I wished my parents would just give me decent pocket money like my friend Brooke’s parents do. I could be in the air-conditioned shopping centre right now, spending it on a double chocolate fudge brownie. I almost threw up. Something was wrong. Yeah, I haven’t mentioned the other side effect that comes with my ghost curse. Sometimes when people are in grave danger and I’m close by, I can feel their pain. I have a theory that it’s because their spirits are on the brink of leaving the world of the living and crossing over into the spirit plane where I regularly deal with them. And just so you know, I don’t appreciate this gift either. It’s a hideous feeling when there’s a car crash in your suburb and suddenly you feel queasy until the ambulance arrives. It’s also quite awkward trying to explain to the emergency services how you know there’s an accident five blocks away if you haven’t seen it yourself—which is one of the reasons that I’m a huge safety freak. I don’t want to have to put up with any more nausea than I have to. I clutched my stomach. The feeling was really strong. Much stronger than usual. Whatever was happening was happening nearby. My head was going foggy. I felt like I was about to pass out. I had to focus. I willed myself to straighten up and tried to take in the external environment. No car noises. No burning smell. No cries of pain. Everything seemed fine except for the pain in my head that was growing stronger. I can’t breathe. My lungs are burning. Someone in the pool! Someone was drowning. Frantically I scanned the pool area. Then I noticed the water-polo pool. A boy was floating. Face down. ‘Lara!’ I yelled. ‘Watch my kids for me!’ I jumped out of the lap pool and ran towards the boy. It was only fifteen metres away, and I made it in seconds. My whole body felt like it was tearing up on the inside. ‘Lifeguards! Help!’ I yelled as I ran forward. The boy was floating not far from the edge. I could reach him if I stretched. There was no way I was getting in the water, feeling as sick as I did. I did not want to be face down on the bottom of the pool myself. I kneeled down beside the pool and stretched out to reach him. Help me! My lungs are burning, I heard in my mind. I couldn’t reach him. My head was throbbing now. I couldn’t go on. I was about to pass out. I can’t hold on much longer. Please hurry! The voice in my mind pleaded again. Determinedly ignoring the pain in my head, I reached forward and tried to grab the boy again. My fingertips brushed his hair. ‘Here, let me in.’ I felt a strong arm pull me up. Thank goodness. The lifeguards were there. The tall, sun-browned lifeguard easily reached the boy with his hands and dragged him towards the edge, then the second lifeguard helped to hoist him out of the water. It was definitely a sign of how close this boy was to dying that I didn’t even have the energy to admire the lifeguards’ bodies. I crouched on the concrete, barely able to raise my head to watch what was happening. The lifeguards were checking to see if the boy was breathing. They were blowing into his mouth. Suddenly the boy was coughing and sitting up. My head cleared. He was going to be all right. I felt two wet hands on my shoulders. ‘Hey, are you okay?’ Lara asked. Trust Lara to have transformed my wild class into Olympic champions in five minutes. No one gets homework on the first day back at school, right? At least that’s what I told myself as I crawled into bed, exhausted. Who does Mrs Murphy think she is, with her big sweat patches and her unreasonable homework assignments? I forcibly pushed the memory of Mrs Murphy’s lecture about ‘staying on top of your maths homework’ to the back of my mind. In its place I tried to visualise the body of the lifeguard from the pool today. It was difficult without remembering the little boy drowning. That was something I didn’t want to think about for a very long time. Preferably never. On the other hand, I was willing to use the topic as an ice-breaker to start a conversation with that lifeguard. My head was still throbbing. Surely I deserved something good to come out of the afternoon. I almost jumped out of my skin. Ella, in typical younger-sibling-brat style, had woken me by clapping her hands in my ear. It was unreasonably late for a social visit. I glanced at my phone on the bedside table to check the time, but the screen was fuzzy. That wasn’t surprising. The spectral emissions from ghosts tend to mess up electronic devices like mobile phones and computers. Considering how often Ella is hanging around, it was amazing that any of my phone calls and text messages came through at all. Ella laughed. ‘You look so funny when you’re angry!’ She playfully threw a pillow at me which I not-so-playfully returned. Her dark eyes and eyebrows stood out against her pale white skin as she laughed. Ella had wide brown eyes that were almost circular when she was thinking but crinkled into a long, flat squint when she smiled. Her small, pointed nose turned up slightly so that she always looked a bit mischievous. Being my twin, she was an identical, ghostly version of me. ‘You shouldn’t be asleep anyway, Fiona. You said we’d talk tonight.’ Ella stuck out her lip in what she probably thought was a cute look of pseudo-sadness. She should have saved it for her boyfriend, because it just infuriated me more. I rolled onto my stomach, covered my head with my pillow and groaned. I allowed myself five seconds to feel sorry for myself. It was nice that I could still talk to Ella fourteen years after she’d died, but did we have to talk when I was trying to sleep? Hopefully, he was better than some of her past horrors. I felt a bit sorry for her. I mean, it’s slim pickings out there as a young ghost. Few people our age tend to die, and the ones who do usually go straight to wherever they’re supposed to go. They don’t usually hang around Canberra as ghosts. If they do, it’s for a reason—some sort of unfinished business. Unfortunately, their unfinished business is rarely pleasant. The type of guys who hang around earth after they’re dead to get revenge on their grandma or to make sure their girlfriend stays faithful to them forever are not usually the greatest boyfriend material. So I wasn’t expecting much of this new boy. As if to confirm my thoughts, suddenly a boy materialised beside my bed. Instantly I scooped up my bed covers to hide my pyjamas. Even if he was a ghost, I didn’t want him to see my love-heart-patterned pyjama suit. ‘Hey! Don’t you know it’s rude to materialise in girls’ bedrooms without knocking!’ I said angrily. The boy looked embarrassed and blushed. ‘It’s okay,’ I muttered and glared at Ella. ‘Have a seat,’ I grudgingly offered him a place at the end of my bed, on top of the messy folds of my bedspread. He sat down appreciatively. Ella sat uninvited at the head of my bed. I quickly checked the boy out. He wasn’t bad looking. He had dark brown hair, intelligent-looking hazel eyes, and a spatter of freckles on his slightly large nose. His square face, solid jaw, and height gave him a sporty look. ‘Hi, Chris. I’m Fiona. Have you been dead long?’ I asked abruptly. Chris looked taken aback and grief flashed across his face. I felt a bit guilty. He seemed like a genuinely nice guy. I wondered how he’d died. Most ghosts are a little sensitive about their deaths. Ella was an exception to the rule, having hardly known life before she died. If I’d taken a second to think about it, I would have known he was a newbie. He was wearing the official tour t-shirt of a band that had performed in Australia this summer, so he must have died this season. He must also be quite well off, I thought dryly. Brett had desperately wanted to go to that show, but even the nose-bleed seats had been well outside my brother’s budget. And, yes, the fact that Chris was wearing that t-shirt now meant it was what he’d been wearing when he’d died. Ghosts appear wearing the same clothes and the same hair style they had the moment they passed over. Bad luck if you drowned at the beach when you were having a fat day. You’d be stuck in your bikini for all of eternity. Thankfully, ghosts don’t keep their fatal wounds when they enter the spiritual plane, sparing me some gory sights. This also means that ghosts don’t age once they’re dead. Once again, Ella is a special case. Maybe due to her connection with me, Ella’s soul has aged at the same rate as I have. When I was a toddler, Ella was a toddler. Now that I’m sixteen, Ella appears as a sixteen-year-old. A side effect of this is that she can let her clothes take whatever form she wants. Naturally, this means she chooses to wear the coolest brands, whilst I have to scrape my pocket money together to get anything half decent. However, it wasn’t just Ella’s reprimand or Chris’ brand new clothes that made clear his relatively recent departure. Chris lacked the supernatural skills of more experienced ghosts. 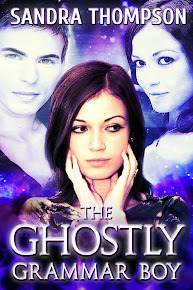 Newly arrived, inexperienced ghosts can’t touch anything in the physical world. No locking doors, rattling window panes, or pushing over china cabinets for them. Unfortunately, it doesn’t take young ghosts long to figure out that, with a bit of focus and practice, they can master this, along with various other ghostly skills, like making things levitate and creating whirlwinds. So it’s the more experienced ghosts that you really have to worry about. On a bad day, they can cause a lot of damage. At first glance, it looked like Chris was sitting on my bed. However, his translucent, glistening form was actually levitating over it and, in some parts, through it. The folds of my bedspread protruded into Chris’ transparent buttocks and thighs. In contrast, the pillow under Ella, was depressed slightly where her shimmering form touched it and, whilst Chris was completely see-through, Ella was a more opaque, glistening mass. Like other ghosts, Ella had developed the ability to touch physical objects early into her ghostly career. How she touched them, I didn’t know, since ghosts were pretty exclusive about the secrets of their world, but it was almost like they could, with concentration, push themselves closer towards our realm of existence to interact with matter. Perhaps for this reason, ghosts seemed to become less translucent and more opaque and solid-looking when they touched things. Conversely, when a ghost wanted to walk through a wall, levitate in the air, or descend into the earth, it would become more transparent again. Experienced ghosts were always switching between the various states, depending on what they wanted to do, whereas newbies tended to float transparently through things, confused by and unable to control their new state of being. Of course I was the only one who could see their different forms. Even in their opaque state, ghosts were still invisible to other people and could not touch them. Although, whilst in their opaque state, ghosts often left traces of evidence, like a book that seemed to be reading itself, or a light going on or off of its own accord. Despite my lack of insight into their other-worldly secrets, I had noticed one thing about ghosts. There was a definite coolness about becoming opaque. It was a demonstration of their supernatural powers and control. Wandering around translucent all the time, like Chris was doing, was like wearing a giant nappy, highlighting your immaturity. So most ghosts liked to stay in their opaque states, unless they had a need to become transparent. Chris was obviously very freshly dead, and I had been pretty tactless to remind him about his passing. ‘Sorry Chris,’ I apologised. ‘How long have you guys been going out?’ I tried to change the subject. ‘Two weeks,’ Ella replied proudly as she stroked Chris on the arm. This seemed to perk him up again. Guys are so predictable, even when they’re dead. But I was jealous that I didn’t have a guy to perk up when I touched him. The last guy I’d touched had splashed me in the face when I’d tried to correct his kicking technique this afternoon. ‘Actually, there’s a special reason I wanted you to meet Chris,’ Ella continued. No surprise there. I haven’t yet met a ghost who isn’t needy. ‘Okay, name it, but make it quick. I’m tired.’ I tried to roll over, but Ella had read my mind and materialised on the other side of me, blocking my way. Defeated, I sat up. ‘What do you want? Revenge? A message sent beyond the grave? You want something hidden? If you want me to kiss your grandma, it’ll cost extra,’ I joked sarcastically. When he smiled, his right eyebrow lifted just slightly. He had a really wide smile that showed off his straight teeth. He was definitely cute. I could see why Ella liked him. Apart from the unfinished business that he was clearly harbouring, that is. Chris and Ella exchanged glances. Ella answered. ‘That’s why we think he was drugged!’ Ella wailed. I sighed. I didn’t know any of the details of Chris’ death, but it wasn’t the first time that I’d had to deal with a ghost who considered himself prematurely robbed of life. Whether he’d been drugged (which I highly doubted) or not, the fact remained that Chris was dead and no amount of investigation into the circumstances could change that. He needed to accept his death and move on. ‘Oh,’ I said sheepishly, feeling stupid for jumping to conclusions. This caught my attention. If there was even a small chance that I could prevent another death, I was willing to help. At the very least it would mean one less ghost hanging around bugging me. ‘Hang on a second,’ I said as I crawled out of bed and grabbed a notebook from my desk. I sat back on my bed, opened the notebook and poised with my pen above the page. Note to self: don’t ever let Chris see me on a bike. Whilst I’m not totally uncoordinated, I definitely have my moments. I’ve been known to throw myself and the bike onto the ground, as a braking technique. I couldn’t believe that Chris was still hanging around earth because his brother was having trouble doing wheelies. Talk about paranoid. Maybe I’d have to have a quiet word to Ella about him. I looked at him incredulously. I continued staring disbelievingly at Chris. I was not convinced. Ella reached over and hugged me. ‘Thank goodness you were there, Fiona!’ she wailed, melodramatically. Trapped under Ella’s tight hug, I felt confused. I didn’t even know any Alans. She released me and continued. This chapter may give away some information revealed at the end of 'Book One: The Ghostly Grammar Boy' so read with caution if you haven't finished book one. I don’t know why Ella chose today to follow me. School camp was hardly a glamour zone. And for someone who didn’t sleep, eat, or have any human needs, she really liked her creature comforts.Ella’s transparent face glistened in the dim light of the camp hall where she had materialised between my boyfriend and me. We were sitting on the floor in a group with our closest friends. I had just been moving in for a handhold with Jason when she’d appeared. I was sure it wasn’t a coincidence. Being a ghost gave her a really unfair advantage for catching me in embarrassing situations. My hand was frozen awkwardly in the air, halfway to Jason. I slowly retracted it, hoping that he wouldn’t notice my strange behaviour. One day I would tell him my secret, but not now. We’d been dating for only a few weeks. There was no way I could tell him that I’d been seeing ghosts ever since my twin sister had passed away at age two. I gave her my best death-stare. She always chose to tease me in front of my friends, knowing that I couldn’t retaliate without looking like I was talking to myself. Ella giggled then purposefully narrowed her dark brown eyes, returning my glare. Her straight, dark brown hair framed her mischievous face. It is extremely distracting to be mimicked by a translucent person who looks identical to you in every way. ‘What’s going on here anyway? Shouldn’t you guys be doing something?’ Ella asked, looking around the hall at the year ten students sitting in scattered groups on the floor. It was a good question. As part of a rigorous week-long schedule of enforced character-building activities, the whole of Canberra High School’s year ten class had been relocated to a bushland sport and rec centre an hour outside of Canberra. We had been looking forward to some parent-free time to hang out with our friends, but were rapidly becoming exhausted from the relentless physical activities and kitchen cleaning roster. Of course our exhaustion had nothing to do with the fact that we’d stayed up all night gossiping and eating junk food in our cabins. Today was day two and, following a questionable breakfast, we’d been marshalled into the hall thirty minutes ago to get into groups for our next activity. So far the teachers had been ignoring us. Startled, I sat up straighter. On second glance, the other teachers looked frazzled too. Mrs Weaver was wiping her spider-veined face with her hands, and Mr Wentworth was biting his lip and staring hard at the floor. Mr Cunningham was tugging on his grey beard and blinking his eyes rapidly. I nudged Jason frantically in the arm and pointed towards the huddle of teachers. Jason turned to look at them. A moment later, his eyebrows shot upwards in surprise. The rumble of chatter in the hall began to descend into silence as one by one the students noticed the teachers’ strange behaviour and alerted their friends. Soon the hall was uncannily quiet as everyone stared at the teachers. The teachers, noticing the sudden attention, huddled closer and whispered frantically to each other. Finally Mrs Murphy broke away from the group and walked to the front of the hall. There was a loud rush of noise as the students in the hall comprehended the information. Mrs Murphy clapped her hands loudly to restore order. As Mrs Murphy finished speaking, the cacophony of voices rose again. Many of the students had flushed faces and were smiling and laughing with their friends, postulating about how many days off school we’d get, and inventing humorous anecdotes about what the incident could be. However, a familiar feeling of dread filled my gut. Most of the other students were blissfully unimaginative about the sorts of horrible things that could strike us in life, having never been touched by death. My daily dealings with members of the departed made me a lot more wary. I’d also felt horribly ill last night—like I always do when someone in my vicinity is close to passing over. It was an unappreciated side effect of my gift. If something had happened at school camp, at least one of the students must know about it. I looked around the hall at the flushed faces. The geeky boys group was sitting closest to us. They had immediately taken advantage of the teachers' distracted attention and discretely pulled out various forbidden electronic gadgets and begun playing with them. Strangely, Dennis, the king of the geeks, was the only one who wasn’t absorbed in the digital world. His thick, dark brown hair stood out strikingly against his pale face, which was even more pasty than usual. His darkly lashed brown eyes were downcast. I could see his chest moving quickly up and down as he took short, shallow breaths. He was terrified. He had to know something about the situation. Before I could talk to him, I felt a ghostly hand on my leg. I shivered. Ghosts can't usually touch people but I am a special case. To me they feel like real, but deathly cold people. Ella’s eyes were wide and her former cheeky grin had disappeared. The uneasiness in my stomach gave a sudden lurch. I had been so distracted with school camp and Ella’s appearance that I hadn’t noticed my usual ghostly follower was missing. I hadn't seen John since yesterday afternoon. John was a year-twelve boy from Lyneham High School who had become a ghost after passing away a few weeks ago. He also happened to be Ella's ex-boyfriend, although their relationship had only lasted one week. At first when Ella had introduced him to me, I'll admit, I'd been slightly jealous. John was undeniably handsome with an athletic build, sandy-coloured hair, and blue eyes. My jealousy had quickly disappeared when I realised that there was one very big problem with John. He was vacant. And I don’t mean just a little bit slow or a dreamy sort of guy. I mean he was really empty. He just seemed to float aimlessly around with nothing to do or say, as if he didn’t have a spirit. To make matters worse, he'd been following me around constantly since the first moment we’d met. It was really creepy, not to mention quite annoying. I understand that occasionally it can be difficult to distinguish between identical twins, but the fact that Ella was translucent and floaty should have helped. There was no excuse for his behaviour. So naturally Ella had dumped him. If there's one thing you shouldn't do, it's give a twin an identity crisis. It hadn't stopped John from following me constantly ever since, though, until now. Surely it couldn't be a coincidence that John had decided to quit stalking me at the same time that something terrible had happened at school camp. I was just trying to figure out how to communicate this to Ella without speaking, when I realised that she wasn't looking at me anymore. Her mouth had dropped open in shock and she was staring wordlessly towards the popular group. The popular group in our year is led by Carly Taylor and her crony Hannah Farmer. I had strangely mixed feelings of resentment, yet solidarity thinking about those two. I’d never really liked them—irritated by their dominant rule over our grade and the cruel way they treated people they deemed below them in the social hierarchy. Carly and Hannah hadn’t particularly liked me either. But we’d mostly managed to keep out of each other’s way for the past three years. Then, a few weeks ago, I’d been unfortunate enough to fly onto their radar when Shane, an attractive (and conceited) guy from Canberra Grammar School had started chasing me. Carly and Hannah had made it their business to teach me that I’d crossed the line into their territory and needed to be punished. It would have saved them a lot of trouble if they’d known that I had no interest in Shane. I had been talking to him only because I suspected he was a murderer. And Shane was only interested in me because we both shared the ability to see ghosts. Shane, Carly, and I had ended up locked in a burning basement at the mercy of a deranged ghost called Chris. It had been necessary for survival to tell Carly about our secret power to see ghosts. Despite her reluctance to believe there could possibly be anything special about me, the strange events that transpired that day eventually convinced her beyond a doubt that I was telling the truth. So now, Carly, the most popular and meanest girl in the school was one of the few people in the world who knew my deepest secret. I wasn’t sure if it was because my supernatural power scared her or because her near-death experience had changed her outlook on life, but to the surprise of my friends, Carly was being civil to me these days. For the first time in the history of high school, Carly acknowledged my presence and even occasionally sat with me in class. Now that I’d gotten to know her, I was begrudgingly starting to think that I’d been too quick to write her off as a superficial bully. Don’t get me wrong, she was still a non-inclusive social mastermind but, occasionally, when she wasn’t hanging out with her accomplice Hannah, she could be nice. For example when I’d confessed to Carly that I’d been having strange nightmares ever since the fire, Carly had actually been sympathetic. I’d told her that for the past few weeks I’d been having disturbingly realistic dreams about Shane’s childhood, as if I was reliving it. The old Carly would have spread it around the school and by lunchtime convinced everyone that I was crazy. Instead, Carly had confessed that she’d been feeling really unsettled since the fire too. She’d pointed out that it was natural that I was having strange dreams about Shane, since he was one of the only other people who can see ghosts. It felt good to finally be able to confide in someone who wasn’t dead. My eyes scanned the group for Carly and Hannah. They didn’t seem to be there; but the whole of year ten was supposed to be in the hall. I didn’t know where they could be. I’d been right that Carly was missing but I’d been wrong about Hannah. Hannah was there. She was sitting amongst her friends. I hadn’t noticed her at first because … she was completely see-through. I could see the floorboards shimmering under her jean-clad legs. Her black singlet top was translucent. Hannah was forever frozen in the clothes that she’d been wearing last night at dinner. Hannah was dead. I felt the blood drain from my face at the sight of Hannah’s ghost. Last night I’d stood behind her in the line for dinner while she had a loud discussion with Carly about who was the least attractive person in our grade. Most of their top candidates had been within earshot. She had then taken two desserts. She had been so full of life - manipulative, selfish life. Now she was dead. Like the rest of the grade, my friends had begun speculating about the situation but I didn’t join in. I felt numb, as if I was on auto pilot. Slowly I rose to my feet, my eyes fixated on Hannah. I saw her try to tap Georgia on the back, but her hand passed straight through Georgia’s body and out the other side. Hannah’s face immediately scrunched up with frustration but she didn’t look surprised. It was obviously not the first time she’d tried it today. I felt a stab of pity for Hannah but I blinked my eyes firmly and tried to stifle the feeling. I couldn’t afford to get emotional. I had to stay focussed. I walked over to the huddle of teachers. Their quiet chatter stopped as soon as I got within earshot. It was obvious that they’d been instructed not to tell us anything about what had happened. Our classmate had died and we weren’t even trusted to know about it. ‘What is it Fiona?’ Mrs Stratton said sharply. Her eyes softened. Perhaps Hannah’s death had reminded her that students were humans too. I turned and walked slowly away from the teachers. It felt hard to pick up my legs. I was used to dealing with ghosts and death by now, but aside from Ella, I’d never really known anyone who had died. I usually only met ghosts once they were already dead. Hannah was sitting between the teachers and the door to the hall. It was a convenient position for me because it meant that I could pass her without raising the suspicions of the teachers. She had given up on tapping Georgia and was now trying to touch Penny, another girl in the popular group. Well, touch was too gentle a word. Hannah had obviously grown frustrated with her friends ignoring her and was now thumping her ghostly arm through Penny, who was completely oblivious to the pummelling. Hopefully Hannah wouldn’t try the same thing with me. Unlike Penny, I could be touched by ghosts and would feel that as a blow to my ribs. As I walked casually past Hannah I let my fingertips brush over the top of her head. Hannah’s friends paid no attention to me – it just looked like my hand was innocently by my side as I walked past their group. Hannah, however, flinched immediately at my touch. She turned to look at me, touching her hair in confusion. I looked directly back into her eyes. I gave an imperceptible nod and then motioned with my head towards the door. Hannah followed me soberly outside. It was the first time I’d ever seen her quiet and docile. It didn’t last long. Ella, too experienced and skilled a ghost to bother doing such mundane things as walking, had disappeared and then re-materialised outside. She was leaning against a tree, inspecting her nails as she waited for us. Ella smiled and gave a friendly wave. ‘What’s going on?’ she said. It looked like she’d been trying to be strong. I guess she’d had a lot of changes to deal with over the past few hours. They say your teenage years are the hardest of your life, but probably turning into a ghost was pretty difficult too. ‘Let’s go to the toilet block to talk,’ I said quietly. Despite the shocking situation, I had to stay grounded about the real world. I couldn’t let my school mates hear me talking to myself. I walked towards the toilet block. Hannah followed me, her eyes downcast. I’d never seen her looking anything but cocky and self-assured before. It almost made me forgive her for all of the humiliating things she’d done to me over the past three years. Ella must have noticed Hannah’s sombre mood too because she tried to comfort her. Hannah’s miserable face scrunched up into one of scorn as she turned to look at Ella. Even as a ghost, Hannah was already set on establishing her dominance. We climbed up a short flight of stairs and entered the unisex toilet block. It was made out of wood that didn’t quite seal from the wind. The breeze whistled through the cracks as I closed the door. The background noise would be perfect for masking our conversation. Finally we could talk. Before Hannah could answer, a loud sob emanated from one of the stalls. I felt my stomach drop. I’d made an amateur mistake. I’d been so careful about not talking outside the hall, but I hadn’t even bothered to check if the cubicles were empty before starting a conversation with the undead. The door to the cubicle swung opened. With a loud blowing of her nose, a blonde, mascara stained face emerged. It was Carly. Carly’s face blanched and she took a step backwards. Despite being saved by Ella a few weeks ago, she still felt deeply uncomfortable in the presence of the supernatural. I could understand it. She couldn’t see them. Then again, they couldn’t touch her, like they could touch me, so who was she to complain? ‘Have you asked Hannah what happened?’ Carly managed to splutter. Even though she believed that Hannah was here, she still couldn’t bring herself to address Hannah directly. Hannah looked slightly miffed at being disregarded by Carly. Even though they were best friends, Carly had always been the clear leader of the popular group, and Hannah had never seemed quite comfortable with being bestowed the graces of second best. However, she pulled herself together to answer Carly’s question. ‘Dennis, is what happened,’ Hannah said. Carly continued looking at me blankly. She was the only person in the room who couldn’t hear Hannah’s response. ‘She said Dennis is what happened,’ I repeated. ‘It was so horrible, Fiona,’ she whispered. ‘I came back to the cabin and she was just lying there, gone.’ Carly’s eyes glazed over as the memory replayed in her mind. Hannah gave a strangled sob. I had to keep both girls focussed before they descended into grief, but it was hard to think of the right thing to say. ‘I’m so sorry,’ I mumbled awkwardly and gave Carly a hug. She sobbed quietly into my shoulder. Steeling myself with strength I didn’t feel I possessed, I pulled away. Carly’s bowed head shot upwards. I felt my insides groan. Another bullying prank by those two. Maybe I’d been wrong to think that Carly had changed in recent months. ‘Tell me exactly what happened,’ I said, looking at Hannah. Carly, understanding that it was time to hear from the victim, nodded her head quietly. Hannah swallowed hard and her throat shimmered in the pale light of the toilet block. I saw Ella’s face wrinkle with disgust at the plan. Luckily Hannah’s attention was focussed on me and she didn’t notice. Carly, of course, couldn’t see Ella at all. I tried to keep my face neutral. However badly Hannah had behaved last night, it couldn’t justify her death. My judgement would only distract her, and we had to get to the bottom of this as soon as possible so that Hannah could move on. ‘So what happened when Dennis came over?’ I asked. ‘Mmmhmmm,’ I said, resisting the urge to cross my arms. Carly fidgeted beside me. She was getting restless waiting in silence. ‘So then I opened the door, and that freak! He shoved me. That’s the last thing I remember because I guess I must have hit my head. The next thing I knew I was sitting in the school hall waiting for our morning activities with you guys. But no one could see me. And I couldn’t touch things…’ Hannah’s voice choked up and her eyes began to fill with shimmering tears. Hannah sniffled. Then her eyes suddenly widened as she comprehended what I’d said. Finding peace. Moving on. Her mortal life was over. Luckily Ella broke the painful silence. Hannah’s face became animated, immediately distracted. ‘We have to go back to the cabin and get it before Dennis does!’ Carly said, oblivious to the fact that she was behind the conversation. At that moment, the door to the toilet block swung open. A pale figure stood framed against the doorway, the bright sunlight streaming in behind him. His thick dark brown hair cast a sinister shadow across his forehead. An ear piercing scream ripped through the startled silence as Carly recognised the intruder. Carly’s scream tore through me like a tomahawk. There was a murderer in our grade, and he was standing just metres from us. I desperately hoped that he hadn’t heard what Carly had said. ‘Shut up Carly!’ Dennis said savagely and took an aggressive step towards her. All at once, Hannah flew into action. ‘You killed me!’ she yelled as she ran towards him in a shimmering blur, prepared to rugby tackle him down the short staircase and into the dirt. ‘Han-..,’ I started to blurt, before remembering that I shouldn’t speak to Hannah in front of Dennis. However, the very next instant Hannah discovered what I’d been about to say. Instead slamming into Dennis as she’d intended, Hannah passed straight through him, without even lifting a hair from his head. The only acknowledgement of Hannah’s attack was a slight shiver from Dennis as he subconsciously detected her presence passing through him. Hannah spun around, her face a mixture of shock at her new permeable physical state, and fury at what Dennis had done to her. Then, suddenly she lurched out of view. A second later it became apparent why. The spindly figure of Mrs Stratton stalked angrily towards the toilet block. Despite being a ghost, Hannah’s teacher avoiding skills were still finely tuned. ‘I told you to shut up,’ Dennis snarled at Carly. Mrs Stratton strode angrily up the staircase and into the toilet block. Ella was so lucky that the teachers couldn’t see her. ‘All of you, get back inside the hall immediately,’ Mrs Stratton hissed. A jittery tension filled the air as we walked back to the hall. I made sure I kept Dennis in front of me but he kept turning around to glare ferociously at Carly. My whole body tingled with fear and I felt sick just walking near him. I tried to keep my face calm but my insides were screaming. We had to go back to the cabin and get the video before Dennis did. When we got back inside the camp hall, Carly and I sat as far away from Dennis as we could manage. It wasn’t far enough away to remove the heavy feeling of horror that had settled in my stomach though. I wondered if it would ever go away, knowing what I did now. It felt like all the security and safety of my school had gone forever to be replaced by the sinister presence of evil. We sat with our backs against the wall, as close to the door as possible. I shut my eyes and tried to focus on the solid feeling of the wall against my back. It didn’t help. When I opened my eyes, I saw that Jason was staring at me. His dark eyebrows were furrowed in concern, and he shrugged his shoulders questioningly at me. When I didn’t respond, he started to get up off the floor. A wave of frustration flooded through my body, followed by a twinge of guilt. There was nothing that I could say to Jason to explain what I’d been up to, and nothing that he could do to help. But that wasn’t his fault. He was only trying to look out for me. If I had just confided in him about my secret skills, he could have shared my burden. But I wasn’t sure enough about him yet. I waved my hands at him dismissively. He must have got the message because he sank back down to the floor, disappointment etched on his face. The twinge of guilt flared again but I stifled it. I would think about it later. Ella was already onto it. If there’s one thing that ghosts do well, it’s distractions. She’d taken Hannah over to the stage and they were standing next to the piano, Ella demonstrating a pushing motion with her hands. I saw Hannah take a moment to focus her mind, then try to push the piano. It moved for a fraction of a second, before she lost concentration and her hands passed straight through it. She fell into and through the piano and collapsed onto the floor, before shaking herself and getting up. She would need a bit more practise at transferring between her natural see-through state to the more opaque state that ghosts use when they want to interact with matter. Ella gave an encouraging nod, then pointed to herself. I knew what would happen next. I grabbed Carly’s arm. Right on cue, the upright piano teetered, then crashed to the ground. As all the faces in the hall turned towards the stage, Carly and I slipped outside. Without a word, we ran along the bushy track which led to the cabins and past the lower carpark. As we approached the carpark, I grabbed Carly’s arm and pulled her off the well-worn path and into the long grass behind the cabins. The carpark was currently empty but I didn’t know when the police and the first parents would arrive. Without slowing our pace, we worked our way behind the first group of cabins and onto the second. I could hear Carly quietly cursing behind me as the spiky grass stabbed at her bare legs. I felt glad that I’d decided to wear jeans today, rather than short shorts like most of the popular group. I felt an icy hand touch my back and I pulled up short. ‘That’s our cabin,’ Hannah said. She pointed to a new looking caravan, slightly separated from the rest of the dormitory style cabins. Much as her ghostly presence creeped me out, I was relieved that Ella and Hannah were back with us. Invisible sentries always come in handy when you’re breaking into places. I nodded and slowly emerged from behind the cabin, then sprinted to the caravan. The others followed behind me. I nodded to Ella, who positioned herself next to the door, facing outwards. She nodded back. Taking a deep breath, I used my t-shirt to cover my hand, then quickly opened the door and stepped inside. Carly and Hannah followed me, then I shut the door behind us. I heard Carly gasp, and then a strange, strangled, gurgling sound. When I turned around it took all of my self-control not to scream. Hannah’s human body was lying in a deep pool of blood on the floor. Her face was bruised and lifeless. The sight of her own dead body must have been too much for her because her ghost was now lying unconscious on the floor, draped through her human body. Her blood lay in a perfect meniscus unaffected by the intrusion of her ghostly form. In fact, it was so hideous that I couldn’t believe that it was real. I felt like I was in an American crime show and I was instantly reminded of the trouble we’d be in if we got caught tampering with the crime scene. Carly had started whimpering beside me, and in my paranoid state, the noise sounded outrageously loud. Carly nodded and began to shiver as she squashed her whimpering and her fear because physical. ‘Can you see the camera from here?’ I asked. Without waiting for Carly’s reply, I scanned the room. My stomach plummeted as I located the bench. It was completely clear. There was no way a camera could be hidden there. Frantically, we surveyed the room. It was cluttered with make-up, junk food, and girly magazines. Next to Hannah’s body was an unmade double bed and on the far side of the caravan was a closed door which must have been the bathroom. Despite the horrific situation, an ungenerous thought flittered through my mind. Whilst the rest of the grade had been crammed into eight-person dormitories with an insect-infested walk to the communal bathrooms, somehow Hannah and Carly had got the only private caravan and bathroom. I couldn’t see the tissue box or a camera amongst all of the mess, but to know for sure we’d have to riffle through the junk. I hesitated. I really didn’t feel like leaving a trail of DNA around. Then, before I could decide what to do next, my eyes caught sight of something that didn’t fit. It was a men’s watch. And I was almost positive that I’d seen it before. ‘Carly,’ I whispered. ‘Is that yours?’ I pointed to the floor next to the bed, desperately hoping that I was wrong. I believed her. And not just because the ugly, braided, green leather straps and oversized face didn’t seem like their style. But because I’d seen the ghostly image of that watch on the arm of John, my recent ghostly stalker and Ella’s ex-boyfriend. This was the physical version of it. But why was it here? ‘Ella, get in here,’ I said quietly. A normal person standing outside couldn’t have heard me but Ella was not a normal person. Within a second she’d materialised inside the caravan. ‘Is that John’s watch?’ I pointed to the floor. Ella’s eyebrows shot upwards. ‘What on earth is that doing here?’ she exclaimed, causing me to wince. No one could hear her except me, but it just seemed wrong that she was talking so loudly. There was something really strange going on here. John had followed me relentlessly for the past few weeks, only to disappear at the exact same time that Hannah had been murdered. And now his physical watch was in Hannah’s cabin. At that moment Hannah’s ghost woke up. She sat up with a jolt amongst the bloody mess of her own body. ‘Teacher!’ she croaked, pointing a shaking finger at the window behind us. I would have laughed at her yet-again impeccable teacher detection skills if I hadn’t been so panicked. The door burst open and a policeman stood in the entrance gaping at us. Behind him stood Mrs Stratton. Her face darkened as she saw us. She shook her head, almost unable to comprehend our insolence. ‘You two are suspended,’ she said. After a moment of heavy silence, the policeman shook himself out of his shock. Forget about Hannah… my life was officially over. The Ghostly Grammar Boy is now available for FREE! Get the ebook on Smashwords, Barnes and Noble, and Kobo or ask Amazon to match the price for a free Kindle version! Check out the reviews on Goodreads! Please have a read and leave a review!